In the first installment of this series we looked at The Introductory Rites , in the second installment we explored the Liturgy of The Word, now we reach the pinnacle of the liturgy of the Church; The Liturgy of The Eucharist.This part of the Mass, and it really isn’t a part at all, it is actually a realization and a culmination of all that came before it, is the most sacred liturgical action performed for our God. Of all the many sacrifices and liturgies that have ever been offered to God, from Abraham’s offerings in the deserts of the Levant, to the Tabernacle at Shilo, and the Temple in Jerusalem, to the present day, the liturgy of the Eucharist is the most sacred because it is a re-presentation (not a representation) of the sacrifice of Christ on Calvary. CCC 1330: The memorial of the Lord’s Passion and Resurrection.The Holy Sacrifice, because it makes present the one sacrifice of Christ the Savior and includes the Church’s offering. The terms holy sacrifice of the Mass, “sacrifice of praise,” spiritual sacrifice, pure and holy sacrifice are also used, since it completes and surpasses all the sacrifices of the Old Covenant. It’s a moment that we “join all the angels and saints” outside the limitations of time and space, and mystically be made present at the foot of the cross where Christ offers Himself as the sacrificial victim to ransom us from the bond of death. To understand the Mass you must understand the priesthood, and to understand the priesthood you must understand the Eucharist. Without Christ’s real presence in the Blessed Sacrament, then the Mass is nothing more than just another “church service” among thousands of other denominations. And at the center of it all is the Eucharist, it is the lynchpin of the other six sacraments, and all the works of the Church. But if you understand what is happening before your eyes, you will understand that you are witnessing a miracle at every Mass you participate in. CCC 1410: It is Christ himself, the eternal high priest of the New Covenant who, acting through the ministry of the priests, offers the Eucharistic sacrifice. And it is the same Christ, really present under the species of bread and wine, who is the offering of the Eucharistic sacrifice. …the other sacred actions and all the activities of the Christian life are bound up with it, flow from it, and are ordered to it. It’s with this in mind that the Second Vatican Council declared that we should have “full, active, and conscious participation” in The Mass. The Church, therefore, earnestly desires that Christ’s faithful, when present at this mystery of faith, should not be there as strangers or silent spectators; on the contrary, through a good understanding of the rites and prayers they should take part in the sacred action conscious of what they are doing, with devotion and full collaboration. They should be instructed by God’s word and be nourished at the table of the Lord’s body; they should give thanks to God; by offering the Immaculate Victim, not only through the hands of the priest, but also with him, they should learn also to offer themselves; through Christ the Mediator, they should be drawn day by day into ever more perfect union with God and with each other, so that finally God may be all in all. So let’s dive deep into this sacred moment that we have the joy of witnessing every time we attend Mass. The offerings are then brought forward. It is praiseworthy for the bread and wine to be presented by the faithful. They are then accepted at an appropriate place by the priest or the deacon and carried to the altar. Even though the faithful no longer bring from their own possessions the bread and wine intended for the liturgy as in the past, nevertheless the rite of carrying up the offerings still retains its force and its spiritual significance. It is well also that money or other gifts for the poor or for the Church, brought by the faithful or collected in the church, should be received. These are to be put in a suitable place but away from the Eucharistic table. After the prayers of the faithful, the gifts are brought to the altar. These gifts are the bread and wine, the elements that will be offered to God as a sacrifice and will miraculously become the Body, Blood, Soul, and Divinity of our Lord and Savior Jesus Christ. The use of bread and wine actually has more than the obvious meaning of it being what Jesus consecrated at the Last Supper. Bread and wine, especially in the context of a covenant meal, has very deep roots in the Old Testament. The very first person to be called a priest in the Bible, Melchizedek the King of Salem, brought out bread and wine when he blessed Abraham. Melchizedek is a type, in typological terms, of Christ (with some people even taking the position that he was a pre-incarnation appearance of the Logos of God, Jesus). Also, when a priest is ordained, he is ordained into the priestly order of Melchizedek and not of the Aaronic priesthood (Hebrews 6:20). This sacrifice that is offered by the priest is a sacrifice of thanksgiving, just like the sacrifice of Melchizedek, because the word Eucharist means “thanksgiving” in Greek. CCC 1333: …The Church sees in the gesture of the king-priest Melchizedek, who “brought out bread and wine,” a prefiguring of her own offering. As GIRM 73 states, it is ordinarily the role of the faithful to bring the gifts forward to the altar, and this action is symbolic of the people presenting both their sacrifices and prayers on the altar of God. In the preparation of the Gifts, especially the prayer over the gifts, we see clearly that the Holy Sacrifice of the Mass is also inextricably linked to the institution of the Eucharist at the Last Supper. Since the Last Supper was a Passover celebration, it only makes sense that many elements in the Liturgy of the Eucharist shares themes and symbols with the Jewish Passover. Cleanse out the old leaven that you may be new dough, as you really are unleavened. For Christ, our Paschal Lamb, has been sacrificed. During the preparation of the gifts, and the instruments on the altar, such as the paten and corporal, you may notice the deacon, or the priest, pouring a small amount of water into the wine in the chalice. The are several reasons for this mingling if water and wine, but the primary reason is because that’s how Jesus would’ve prepared the cup that He gave to His disciples at the Last Supper. It was a common practice in the ancient world to dilute wine before serving it, but it was especially prescribed in the Passover liturgy that Christ and His disciples were celebrating on the night of the last supper. The Haggadah (the book that lays out the liturgy of the Seder meal, or you could say it’s the Jewish equivalent of the GIRM) prescribes the way the meal is to be eaten, and the dishes to be served, including the mingling of water and wine. The Babylonian Talmud even says exactly how much water to put into the wine. This all took on deep messianic symbolism by the early Church Fathers; with some seeing it as a representation of the water and blood that flowed from Christ’s side on the cross; others seen the wine as a representation of Christ, and the water as the Church, joined together in one cup; and still others seen it as the hypostatic union of Christ’s divinity and humanity. When Jesus and His disciples ate meals together, and when they celebrated the Last Supper, He would have said blessings over the bread and wine that would sound very similar to the prayers over the gifts that we hear at every Mass. Since Christianity comes from Jewish roots, this similarity shouldn’t surprise us at all. Universe, Who creates the fruit of the vine. This is another of the several quiet prayers that the faithful rarely hear. And like the last one, it is a very beautiful prayer that shows the servant heart that the priest is supposed to have. A Catholic priest is not the high official, like pagan priests were in the ancient world, he is a servant of the people, and he reminds himself of this fact at every Mass. This is why one of the Pope’s titles is “Servant of the Servants of God” because he has an important job to shepherd the people, but not to rule them as an absolute tyrant. At this part of the Mass, the priest turns from the altar and washes his hands with the help of the altar servers or the deacon. This may come as a surprise to many, but this hand washing is actually the second time the priest washes his hands as part of the Mass; the first time takes place when he is vesting (putting on his liturgical clothing) and is part of a series of prayers called the vesting prayers. This is a classic penitential psalm, asking God to renew the psalmist’s heart and cleanse him from his sins. Many Catholics will link this hand washing to the way Pilate washes his hands during Christ’s Passion. But the priest is not acting “in persona Pilate” as it were, he is performing his priestly duties of offering sacrifice to God In Persona Chisti. In the letter to the Hebrews, it is said that Christ is our High Priest, and He is also the sacrificial victim, who offers Himself on the altar for the atonement of the whole world. So for the priest to wash his hands of the “guilt” of the sacrifice doesn’t make sense. But hand washing, as a liturgical act, actually predates the Passion of Our Lord by about 1300 years. After the First council of Jerusalem, that is recorded in the Acts of the Apostles, the Church declared that we are no longer bound by the ceremonial Law of the Old Covenant. So then why did we keep this ceremonial act of washing, and why is it done so publicly beside the altar? Because the Church is reminding us, not with words, but with actions visible before us, that the Mass is a sacrifice, and the priest is preparing himself to offer that sacrifice! This prayer is named such because of the opening words, “pray brethren” in English, and at this command we stand at attention. When we pray at Mass, there are two possible positions, one is standing, and the other kneeling. During the coming Eucharistic prayer, we will employ both positions. Kneeling in reverence and petition during the Epiclesis and Anamnesis, and standing as the body of Christ, the Church Militant, at the Lord’s Prayer. 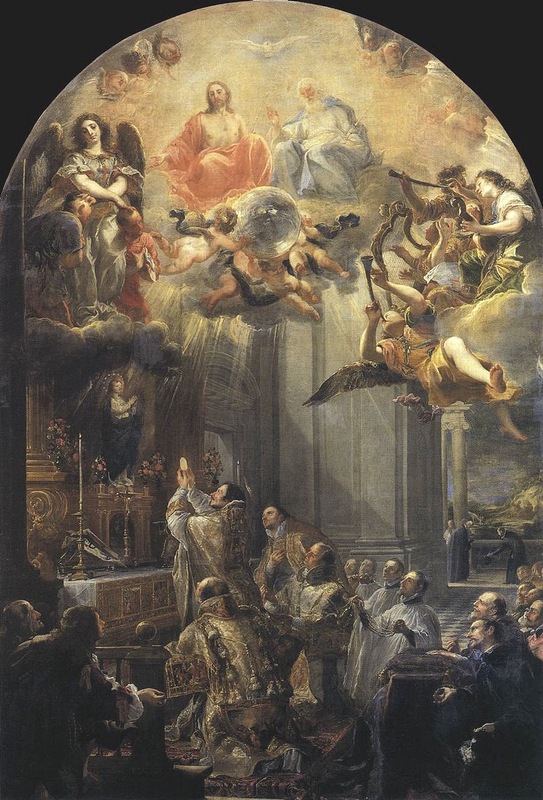 The Saints have said that if you could see with spiritual eyes, you’d see your guardian angel walking up to the altar and offering your intentions with those of the priest, uniting our sacrifice with that of the Mass (Colossians 1:24). Also in this prayer, the priest is preparing to bring the offering of this sacrificial victim to the very throne of God, he is preparing for this miraculous moment by petitioning God to accept this sacrifice on behalf of His people, and preparing for the moment when we enter into the timeless sacrifice of Calvary. After this prayer, the priest extends his hands over the gifts and prays over them. The people, uniting themselves to this entreaty, make the prayer their own with the acclamation, Amen. This entry was posted in All Posts/Archive, Catholic Life, The Mass. Tagged Bible, catholic, catholicchurch, Catholicism, catholicmass, Christ, christian, church, eucharist, Featured, Jesus, liturgy, Liturgy of the Eucharist, mass, pope, themass, vatican.